Antesiphuncular sclerites are little developed in apterae, but usually well developed in alates (see second picture above). The images below are micrographs of Uroleucon campanulae in alcohol from Campanula rotundifoli in Dundreggan, Scotland. 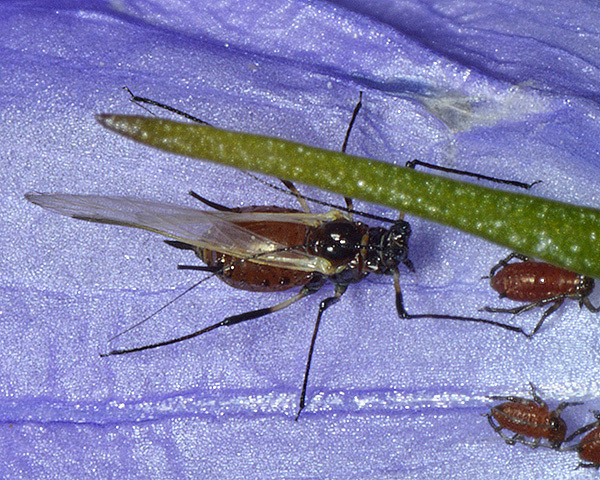 The clarified slide mounts below are of adult viviparous female Uroleucon campanulae : wingless, and winged. 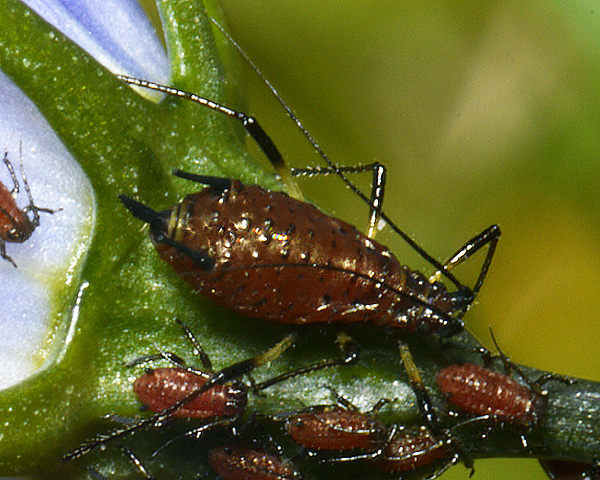 Uroleucon campanulae does not seem to be a common aphid and it has been little studied. We have only found it once - in July at Dundreggan in northern Scotland. Harebells (Campanula rotundifolia) were common, but Uroleucon campanulae was only found in one restricted location on about ten plants - just adjacent to a little used road. Uroleucon campanulae spends its entire life cycle on bellflowers and does not host alternate. 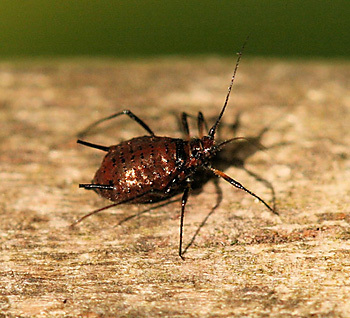 Sexual forms develop in autumn and the aphid overwinters in the egg stage. 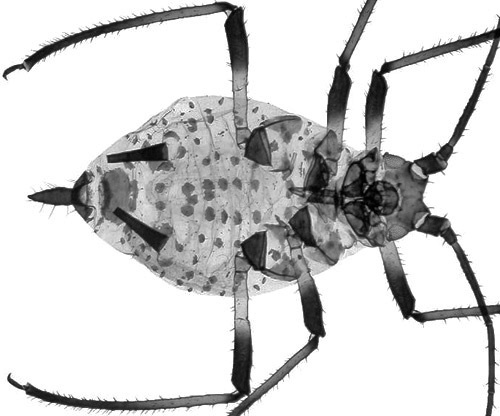 Osiadacz & Halaj (2011) have looked at the diversity of aphid species on Campanulaceae (bellflowers). 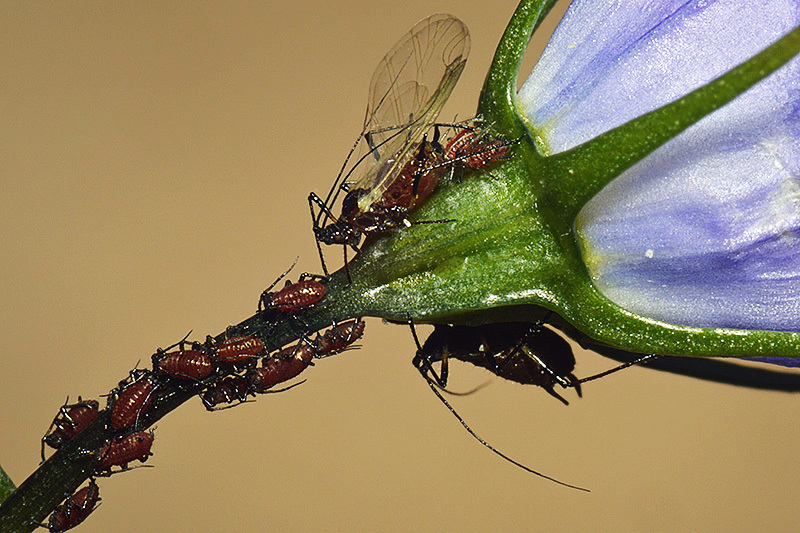 They noted that bellflowers have been colonized by only a limited number of aphids. 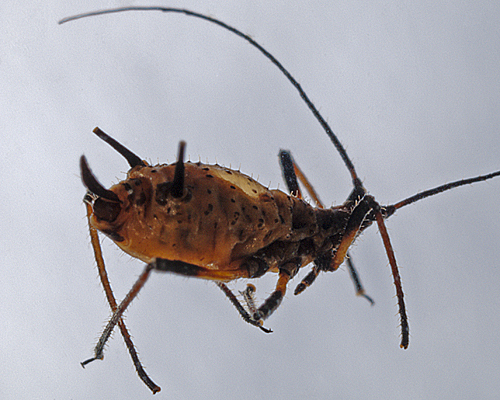 Worldwide only a dozen or so aphid species are specifically associated with this family, whereas in Poland alone there are some 150 species associated with Asteraceae. Yet the Campanulaceae have about 2000 species worldwide. With the Asteraceae it seems there was coevolution of the aphid and plant species, but this has not happened with Campanulaceae. The plant family appears to have no notable defences and the sap is not toxic. The low diversity seems to be because the vast majority of the Campanulaceae grow in very dry habitats, mainly xerothermic grasslands. 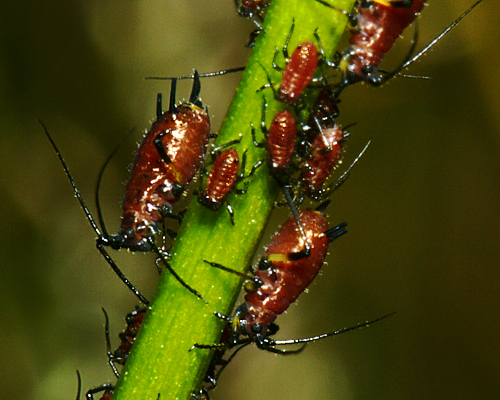 Such habitats are 'challenging' for soft-bodied insects such as aphids. Also the degree of coverage by the plants is low - they grow separately rather than in dense aggregations. 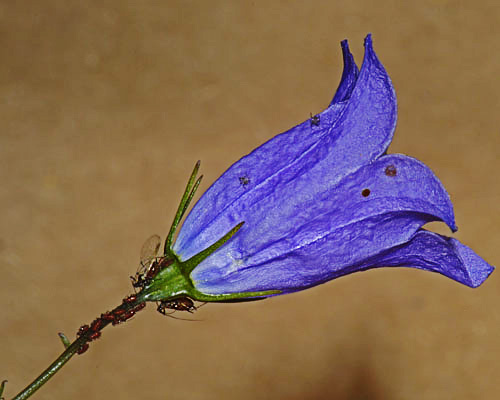 Uroleucon campanulae has been recorded from 14 Campanula species. 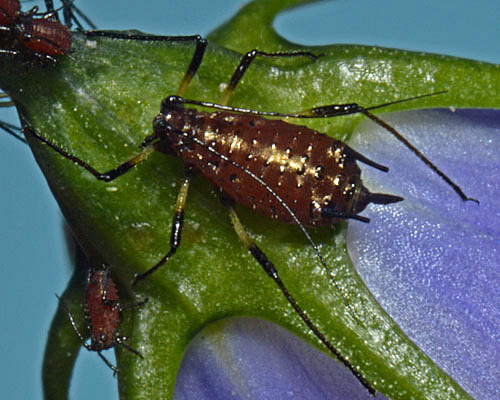 Uroleucon campanulae is mentioned as a minor pest of decorative Campanula in Poland by Wilkaniec et al. (2008). I have struggled with this one, and think it might be one of the Uroleucon. 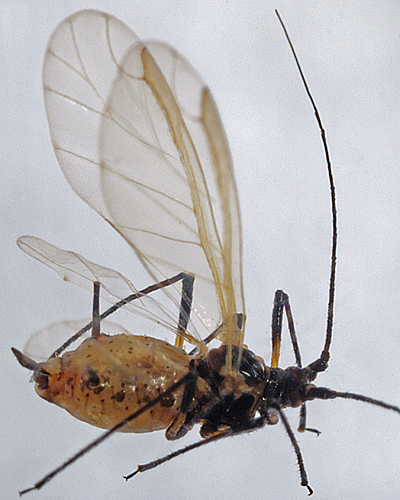 It has all black siphunculi and cauda, black legs but orange bases to front & mid femora, and black antennae, which at least seems to fit Uroleucon campanulae. 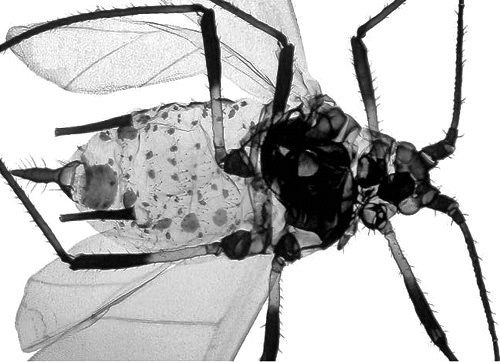 I can also see that it has very fine striations across the abdomen, almost like a fine mesh. As far as harebells are concerned, we did have some in the lawn, and there are a few patches round about. Seen 26/8/2012. One rubbish photo to show the overall shape from the rear, and the other 2 are detailed. 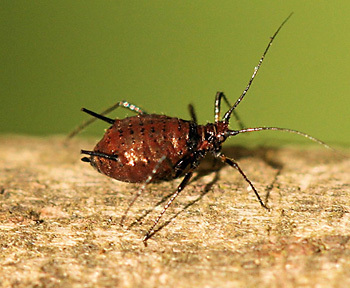 Your reddish aphid is indeed Uroleucon campanulae. It can look quite dramatic when you get a large colony on a harebell flower. 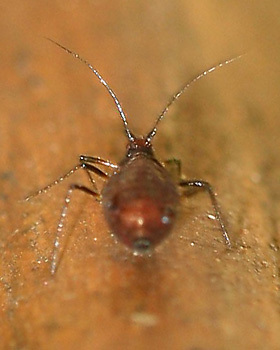 Thanks very much for the Harebell aphid confirmation. That is good.